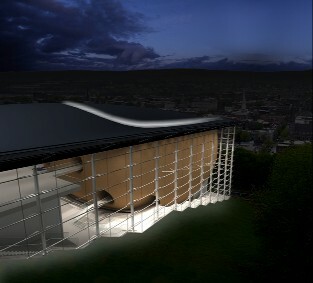 Welcome to this site, focusing on an advanced consulting research project undertaken to simulate and auralize the acoustics of the 1,200-seat concert hall in the new Experimental Media and Performing Arts Center at Rensselaer. Here you will find a description of the project, the simulation & auralization methods used to effect a solution, and an online binaural walkthrough of the venue. To learn more about eMPAC, click here. Listen now to the eMPAC auralizations in Binaural Format (requires headphones and a broadband connection). Goals of the simulation and auralization project and the structure of the eMPAC building. Learn about the new simulation methods developed for the project and their application to high-resolution auralization. Explore the Ambisonics rendering techniques used in preparing the auralizations and in the original presentation of the sounds using a multichannel loudspeaker array. The methods used to transcode the multichannel Ambisonics auralizations into a web-deliverable Binaural format. This material is based upon work supported by eMPAC at Rensselaer.